A short update about what is going on - I am still working on a lot of the assets and environments for the first mission along with some tweaks to the research lab that will serve as the "hub" for missions. Progress is somewhat slow but keep in mind that just about everything I am making for Site 37 is "from scratch". I have been making models in blender, exporting them over to Substance Painter for texturing, then importing them into Unreal 4. Along the way I make various tweaks and alterations, especially if they don't end up looking as nice as I would want them to in UE4. After initial planning including sketching or finding references, the model starts in Blender. Typically with a single 1mx1m cube that I either remove or turn into whatever I need to begin the model. In this case, I had to make sure that each pipe "exited" the model at the same distance from the side so that it could line up with itself in various configurations. After the model is complete, I create the UV map and Lightmap, then export the FBX and import it into Substance Painter. From there, I create a texture and export each texture map to be used in Unreal 4. Finally, I import the model into Unreal 4 and create a material from the textures, making any changes I can to make sure it fits in with the environment. If I am not quite satisfied, I may go back to Blender or Painter to make changes. 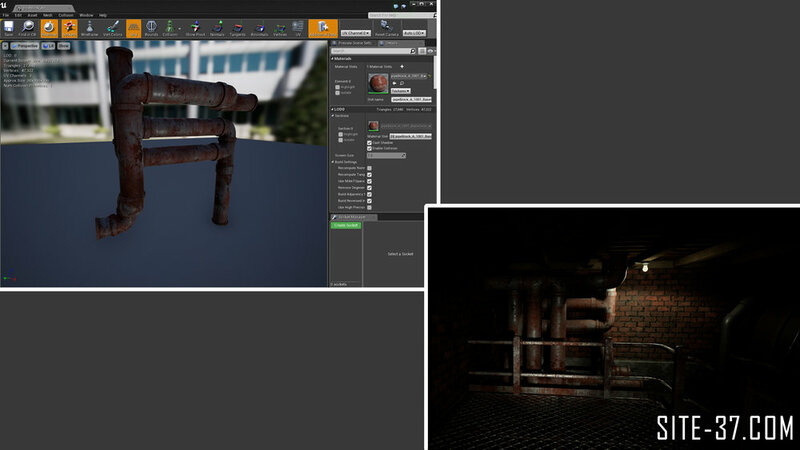 As you may have guessed, it takes quite a bit of time before a model goes from the design and planning phase into Unreal 4 and even then, it may be altered or completely scrapped if it doesn't end up working with the environment.